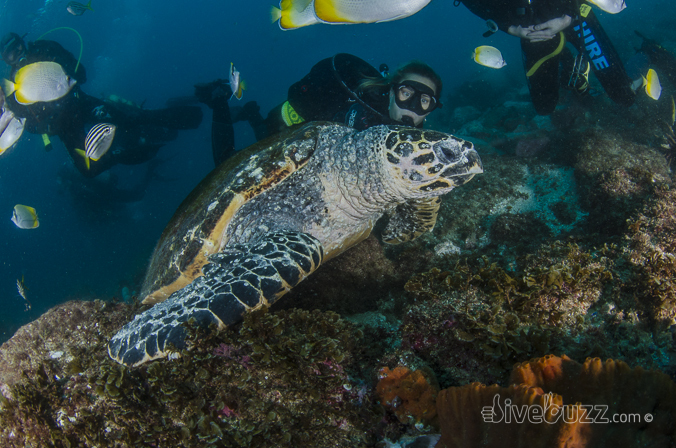 A favourite amongst scuba divers around the world, sea turtles have been on Earth for more than 100 million years. But having survived the extinction of the dinosaurs, 65 million years ago, they now face many modern, man-made pressures. So, how much do you know about these ancient sea creatures? Sea turtles can be found in all oceans except for the polar regions. Some species travel between oceans. But the flatback sea turtle, for instance, is found solely on the northern coast of Australia and southern Papua New Guinea. Of the seven, six can be found on the Great Barrier Reef. The Kemp’s Ridley sea turtle is the odd one out, and in fact the rarest of all sea turtles on the planet. It can be found off the coast of New Jersey, in the Gulf of Mexico and Florida. Although they spend their life in the ocean, and the vast majority of that submerged, they are cold-blooded reptiles and breath air. When surfacing to breathe, a sea turtle can quickly refill its lungs with a single explosive exhalation and rapid inhalation. Their large lungs have adapted to permit rapid exchange of oxygen and to avoid trapping gases during deep dives. They have developed an anaerobic system of energy metabolism, meaning they can stay under water for long periods of time. So, when they are swimming, they need to come up for air approx every 20 minutes. But when resting, they can stay submerged for several hours. That’s why it’s important to try and not wake a sea turtle if you spot one asleep on your night dive! The hard upper section of the turtles shell structure is called the carapace. The flat underside of the turtle shell is called the plastron. And the bony external plates that cover the turtles shell and create the patterns are called scutes. The species are primarily distinguished by their anatomy: for instance, the prefrontal scales on the head, or the number of and shape of scutes on the carapace. 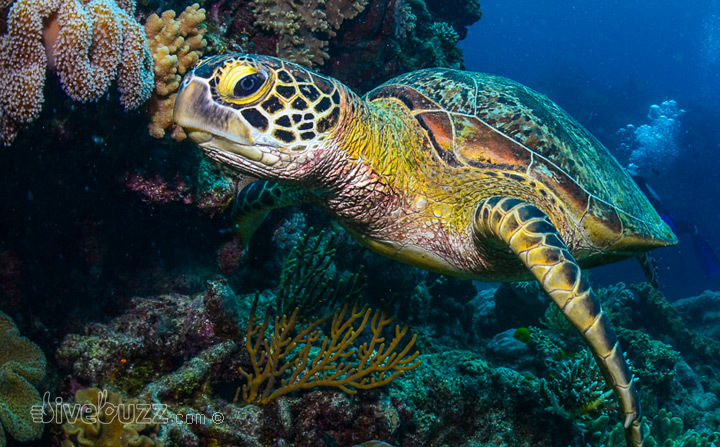 For example, a green sea turtle has two plates between its eyes, whereas a hawksbill turtle has four. The leatherback is the only sea turtle that does not have a hard shell; instead, it bears a mosaic of bony plates beneath its leathery skin. It is the largest sea turtle, measuring 1.8 to 2.1 m in length at maturity, and 1 to 1.5 m in width, weighing up to 590 kg. Other species are smaller, being mostly 0.60 to 1.2 m in length and proportionally narrower. The beautiful patterns of the scutes on the caraspace of a green sea turtle. Sea turtles are generally found in the waters over continental shelves. After taking to the water for the first time, males will not return to shore again. During the first three to five years of life, sea turtles spend most of their time in the pelagic zone floating in seaweed beds. Once the sea turtle has reached adulthood it moves closer to the shore. It can take decades (30 to 50 years) for sea turtles to reach sexual maturity. It is not known how long a sea turtle can live for, but a lifespan of 80 years is feasible for sea turtles. After mating at sea, adult female sea turtles will come ashore, almost always at night, to lay their eggs on sandy beaches during the nesting season. The vast majority of females return to the same beach where they hatched many years previously. Using her hind flippers to dig a hole, she then deposits around 50 to 200 soft-shelled eggs, depending on the species. After laying, she re-fills the nest with sand and returns to the ocean. The hatchling’s gender depends on the sand temperature. Lighter sands maintain higher temperatures, which decreases incubation time and results in more female hatchlings. Incubation takes about two to three months. The eggs in one nest hatch together over a very short period of time. When ready, hatchlings tear their shells apart with their snout and dig through the sand, again, usually at night. Once they reach the surface, they instinctively head towards the sea by orienting towards the brightest direction and use the topography of the surrounding horizon line. They have to dodgy a number of predators, such as seabirds, mammals and crabs. The hatchlings then proceed into the ocean, where a variety of marine predators await them. Sadly, only an estimated one in 1000 will survive to adulthood. These natural threats, however, are not the reasons sea turtle populations have plummeted toward extinction. 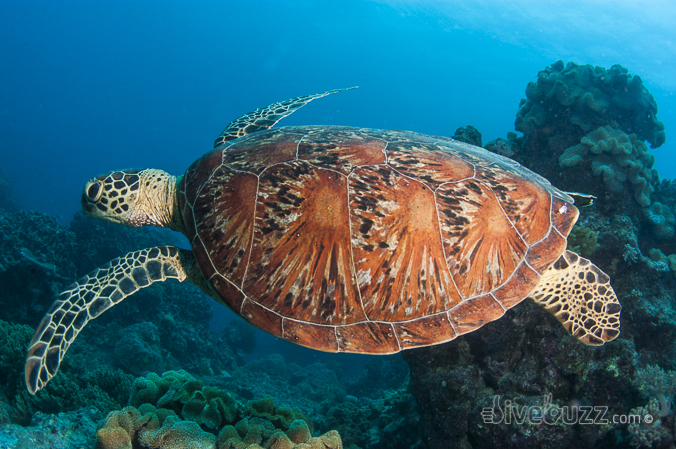 A hawksbill turtle has four plates between it’s eyes, whereas a green sea turtle has two. A recent study showed that the marine turtles use a relatively simple navigation system involving the earth’s magnetic field, and this allows them to return to the same egg-laying site without having the ability to correct for the deflection of ocean currents. It is well known that many animals can tell latitudes, or north-south direction, using cues from the Earth’s magnetic field. But a few, such as the loggerhead turtle, also seem to be capable of deciphering east-west direction using a magnetic map. Telling east-west direction is quite a feat because while the Earth’s magnetic field varies predictably with latitude, less information is available about the field with longitude. 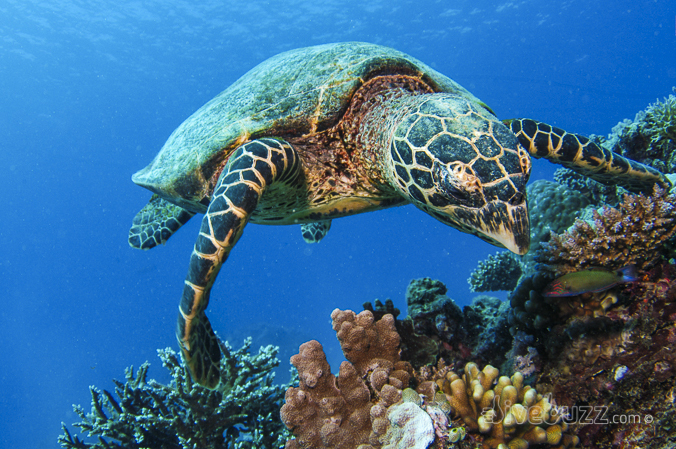 Sea turtles feed on a wide range of animals and plants. They are mostly omnivorous (neither carnivore nor herbivore) in their adult life, except the green sea turtle which is herbivorous, changing from a carnivorous diet when young. Some species specialise on certain prey; sea sponges are the principal food of hawksbill sea turtles, constituting 70–95% of their diet. Leatherback turtles feed almost exclusively on jellyfish and help control jellyfish populations. They even enjoy immunity from the sting of the deadly box jellyfish and regularly eat them. All 7 species of marine turtles are listed on Appendix I of the Convention on International Trade in Endangered Species of Wild Fauna and Flora (CITES). Of the seven species of sea turtles, five are listed on the IUCN Red List of Endangered Species as either “endangered” or “critically endangered”. The Olive Ridley turtle is listed as “vulnerable” and the Flatback turtle is listed as “Data Deficient”, meaning that its conservation status is unclear due to lack of data. Although they face many natural challenges, it is the human impact that has lead to large turtle population declines. Turtles face many man-made pressures. Although it is illegal to hunt most species in many countries, sea turtles are still caught worldwide for their shells, and to a much lesser extent, for their eggs and meat on the black market. Tortoiseshell, a traditional decorative ornamental material used in Japan and China, comes from the carapace scutes of the hawksbill sea turtle. Perhaps one of the most significant threats comes from commercial fishing practices and associated by-catch. Long-lining and trawling has been identified as a major cause of accidental sea turtle death. Entanglement in fisherman’s nets is common in both live nets and abandoned ‘ghost’ nets floating in the sea. Sea turtles must surface to breathe and dive to feed, so when entangled in netting, they are either unable to surface and therefore drown, or unable to dive down in order to feed and starve to death. Plastics and other pollution are also a significant problem. Plastic pollution is often mistaken for food such as jellyfish and ingested, which can block the intestines and be fatal. An illness called ‘floaters syndrome’ is an obstruction that occurs in the turtle’s gut causing air to become trapped between the shell and the body and impacting the animals ability to dive down to eat. A common sign that a turtle may have floaters syndrome is a turtle found at the surface with a heavy coating of algae on its shell. If these turtles are not found they will ultimately starve. Onshore and beach development is another area which threatens sea turtles, through habitat destruction and alteration. Since many sea turtles return to the same beach each time to nest, development can disrupt the cycle. Environmental contamination from coastal runoff and dredging can threaten habits where sea turtles live, feed and reproduce. Boat traffic and propeller damage is another man-made threat. Turtles swimming or feeding at or just beneath the surface of the water are particularly vulnerable to boat and vessel strikes, which can result in serious propeller injuries and death. Disease is also a major threat to turtles in some areas of the world. A disease known as fibropapillomatosis manifests itself in turtles through external tumors. These tumors can grow to be so large that they hinder a sea turtle’s ability to see, eat, and swim, therefore rendering the sea turtle unable to survive. The majority of the cases of fibropapillomatosis have been diagnosed in the green sea turtle, but it is not known why there are particularly susceptible. The loggerhead sea turtle is the world’s largest hard-shelled turtle and gets it’s common name from the animal’s distinctive large head. Although the biggest threat to turtle survival are human-related activities, human intervention can also have a positive impact. In an attempt to lessen the number of turtles killed by fishing incidents, several new types of turtle-safe fishing equipment have been introduced such as the turtle excluder devices used when bottom trawling and circle hooks in longlining. Hunting and poaching has been outlawed in most countries and turtle conservation education has been growing in both in size and efficiency, although it remains a problem in some parts of the world. Many rehabilitation centres have been established around the world, to rescue sick or injured turtles, rehabilitating these turtles through various types of treatment and/or surgery, and releasing them back into the ocean once they have been successfully nursed back to health. Over the last 20 years, ecotourism has played an important role in raising awareness and helping endangered populations of sea turtles. Visiting ecotourists not only get to experience these sea turtles first hand, but their tourist dollars help to fund conservation efforts so that local communities become involved in and benefit from protecting turtles and their eggs. When managed well, this can have a positive impact on local sea turtle populations. Like many of the sea creatures that SCUBA divers have the privilege of sharing the ocean with, sea turtles are worth much more alive than dead. And the more people who realise this, the better for their long term future. If you know of any turtle conservation projects, please share them in the comments below.